Select this Buy Now Link and choose how many bottles you want each month on the next page. Each bottle is free with just $5.95 added for shipping and handling. Please Call 800-210-1268 to take advantage of the monthly Free Vitamin D For Life Program. Please click here to confirm your selection of the AUTO SHIP feature. By selecting and confirming the Auto Ship option your product will be automatically shipped directly to you every month. You will be billed at the time of each shipment. This is a subscription program and you can cancel at any time through the Member Login or by calling customer service Mon – Fri from 8 am to 7 pm CST at 800-210-1268. Free Vitamin D3 - * FREE! * You only pay $5.95 per bottle for shipping and handling. Hello, my name is Bob Barefoot and I am absolutely delighted that you have chosen to help rid yourself of disease. It is absolutely true, research proves that vitamin-D can help to ward off a host of diseases. But you should understand that the main thing that it does is enable you to dramatically improve your absorption of calcium, magnesium, minerals and nutrients which supports your body’s ability to heal and maintain health and vitality. To ensure your overall nutrition and health, I recommend using Bob’s Best Coral Calcium 2000 which is full of marine grade coral calcium from Okinawa, Japan along with our Bobs Best Free Vitamin D3. When you combine this coral with the vitamin-D and 2 hours of sunlight daily on your eyes, miracles can happen. The sunlight on your eyes cause the glands behind them, the pituitary, penal and hypo thymus glands, to start to produce hormones and enzymes, all of which will make you happy and healthy. This program should prevent you from getting any disease in the future, it should also slow down the aging process while giving you several more years of healthy and happy living. Cure yourself first, then lets cure America and then the World. Vitamin D3 is an essential building block in maintaining a healthy, vigorous immune system. Studies in recent years, reporting the dangers of unnecessary sun exposure, are causing many people to drastically limit the time spent outdoors. Health providers have reported an alarming increase in Vitamin D deficient patients, and believe the trend to avoid exposure to natural sunlight has created this situation. As a dedicated nutritionist, Robert Barefoot is very knowledgeable concerning the proper nutritional and dietary requirements of the human body. Bob recommends that everyone spend 2 hours in the sun every day (without sunglasses). Natural sunlight provides essential benefits for our bodies. 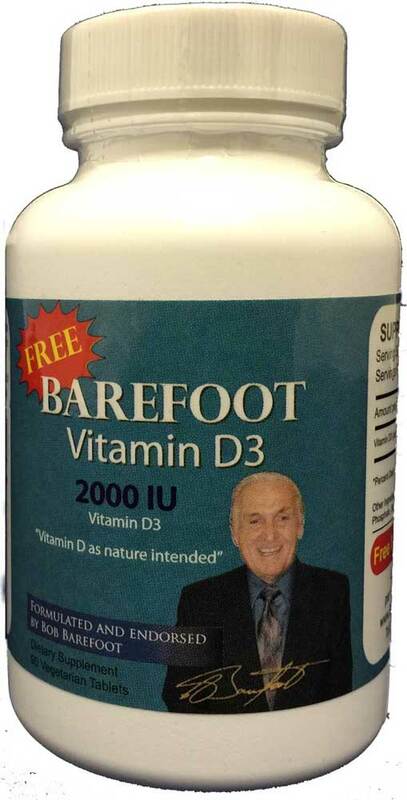 Bob's Best Vitamin D3 is an example of Barefoot's commitment to provide consumers with health supplements containing only the purest and most effective ingredients. Bob's Best Vitamin D3 uses Cholecalciferol (Natural Vitamin D3) which is the most efficient and natural form. It is the only viable alternative to meeting the body's need for Natural Vitamin D.
There are other Vitamin D supplements that use Ergocalciferol or Vitamin D2, which is un-natural, far less effective and could actually be toxic. The body is equipped with a network of Vitamin D Receptors. Essentially, VDR's are present in the majority of the body's cells and in the lining of the intestinal tract. Vitamin D Receptors in the intestinal tract aid in the absorption of calcium, magnesium and other nutrients the body requires to maintain strong teeth and bones and to sustain alkalinity and overall good health. Researchers suggest that the high levels of VDRs present in the immune system are another indicator that the proper levels of Natural Vitamin D3 are a vital contributor to a strong and healthy immune system. 90 2000 iu tablets per bottle: Suggested use: 3 tablets per day Recommended for all Adults.